After spending most of the the past two months “in the weeds” about the nitty-gritty details of various events, I’d like to spend this week’s column talking about a “big picture” idea. I first read about this concept around the end of February, and it’s been rattling around in my head ever since. I find that’s one mark of a great idea, a sign that something truly bears repeating. Over a hundred years ago, an Italian economist named Vilfredo Pareto had a pea garden. One day, he realized that the vast majority of the peas from his garden grew from just a handful of pea pods. Being an economist, he observed that the distribution of land amongst the Italian population was much the same way, with a majority of land being held by a minority of the population. In fact, in both instances, about 80% of the output or results (i.e. the peas) came from just 20% of the inputs or actions (i.e. the pea pods). Moreover, Pareto observed that this trend held for other countries, and others eventually applied the rule to other fields, especially in business (e.g. 80% of sales come from 20% of customers) and management (80% of a company’s value come from 20% of its staff). These observations were eventually popularized as the Pareto Principle, or more simply, the 80/20 Rule. What 20% of my possessions account for 80% of my value? What 20% of my leisure time brings me 80% of my enjoyment? Who are the 20% of people I spend 80% of my time talking to on Facebook? What’s the 80% of my clothes that I wear only 20% of the time? As a judge, what 20% of my activities result in 80% of my impact, satisfaction, or enjoyment? For the purposes of this column, that last question was the one that really sparked my imagination and got me thinking. And it’s very clear to me what the main 80/20 in my judging life is right now. Over the past few months, working on Bearz Repeating has taken only about 20% of my time, but has easily accounted for 80% of my personal satisfaction, and likely 80% of the impact I’ve made on other judges as well. And I’m very grateful for all the support I’ve received from you, my readers, and the rest the judging community. It’s very exciting that there’s so much interest in a weekly column about big ideas, and I hope others will follow. But what about the other 80% of my time? Does that mean the last 20% of impact I’ve had is irrelevant? No, of course not. I love judging events, mentoring other judges, and all the other activities that make up my judging life. In fact, I’ve been a judge for almost three years now. And while the biggest reason I’ve stayed so involved in the judge program is, simply, the people — I’ve made so many incredible friends through judging — the second most important reason is that virtually everything I do in the judge program actually feels impactful and meaningful. In judging, however, the story is quite different. I believe that applying the 80/20 Rule to judging does not produce a strict dichotomy of productive/unproductive, but rather a gradient of most meaningful/less meaningful, of most enjoyable/less enjoyable. If I felt I was spending 80% of my time as a judge on largely pointless endeavors, I wouldn’t still be a judge. So what does this all actually mean for you? As Manson writes, “there’s an efficiency to every aspect of our life, to everything we do. And not only is there an efficiency, but we have control and influence over that efficiency. It’s something we can take responsibility for and improve.” Just like it’s worth periodically reconsidering how you approach “basic” things like introductions at events, the Pareto Principle is a great lens for self-evaluation, and a wonderful tool for critically inspecting things you haven’t given much thought. While there are many ways to apply the Pareto Principle to judging, here are four that I’ve found especially useful so far. As a counterpoint to the first half of this article, which was focused on non-event activities, these examples are focused on events. However, I believe Pareto is equally relevant for judging activities both at events and outside them. The first is using the 80/20 Rule to help you decide what roles to request at events. Do you find that you enjoy one of the major teams (deck checks, paper, logistics, floor) substantially more than the others? How much do you enjoy working side events, compared to how often you’re assigned to that role? Identifying and requesting the roles that bring you the most enjoyment will make you both happier and more productive — and the players will notice, too. 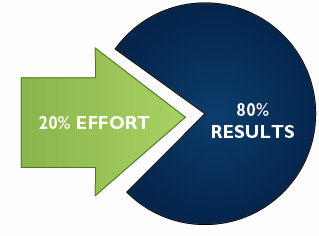 Another application of Pareto is your general philosophy for approaching events. At a given event, what are the 20% of interactions that result in 80% of your enjoyment and satisfaction? Are these interactions primarily with players, other judges, or a mix of both? Do you really enjoy planning social activities, like judge dinner? Some judges focus on making sure events run smoothly, while others prioritize providing strong customer service to individual players. The Pareto Principle can help you identify where you fall along this spectrum — but also consider stretching outside of your comfort zone and try focusing on something new. Third, what about the players’ perspective? What are the 20% of our interactions with them that result in 80% of their satisfaction? What is the 20% that we are doing — or could be doing — to produce 80% of their happiness? Players interact with judges all day, but as the 80/20 Rule suggests, their overall experience is most impacted by just a few things. At your next event, what do you want those few things going to be? Finally, the Pareto Principle is relevant in a particular way for the managers of an event — that is, its head judge and team leads. If each team lead is responsible for four other judges, then 20% of your judges are team leads. As head judge, the conversations you have with these 20% will likely account for 80% of your interactions with the whole judge staff. So pick them wisely. Overall, I’ve found the Pareto Principle to be an incredibly helpful tool for analyzing my life in a new, refreshing way. What do you think? Spend a while thinking about how to “80/20” your own judging life. I’d love to hear what you conclude!